I’ve said it before and doubtless I will say it again: readers of Meanwhile, at the Manse come up with the most interesting things. This time, it’s a mystery that needs solving. I’d like to say I’m putting on my Nancy Drew headscarf yet again, but actually I don’t think Nancy could solve this one. Not the Hardy Boys either. They’re all a little too urban for this one. This particular mystery has to do with an unusual design element in some 19th-century Hastings County barns, and why it might have been put there. The detectives we need are people knowledgeable about farming history and traditions in our part of the world. Detectives: I know who you are. And I want to hear from you! As does reader Greg Polan, who got me going on this fascinating line of inquiry. Well! The words “enigmatic” and “seemingly forgotten over time” are enough to grab my attention. 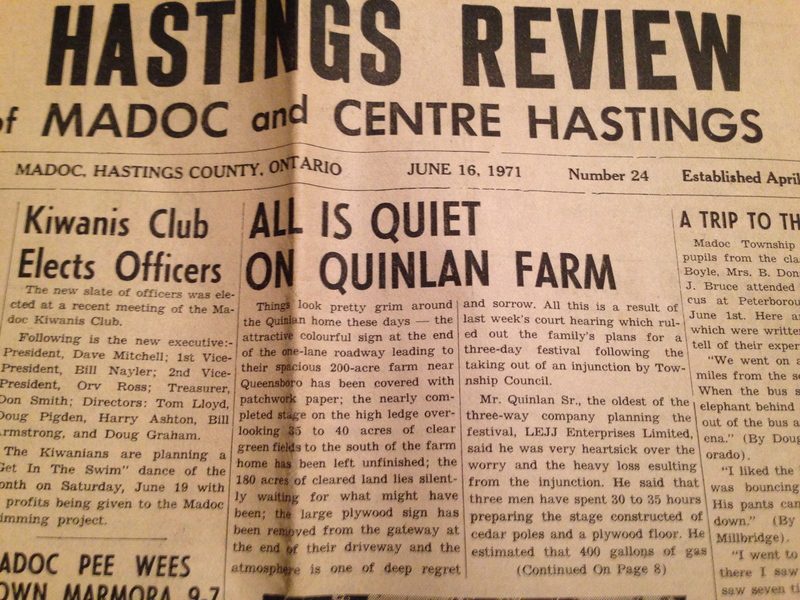 Intrigued, I asked Greg to elaborate, and he steered me to a scholarly article on the barn mystery that was published back in 1981 by Thomas F. McIlwraith of the University of Toronto, who is now emeritus professor in U of T’s Department of Geography and Planning. I’ll tell you more about the interesting contents of that article in just a bit. Wow – that’s close to home! Cooper Road is just a few miles west of Queensborough. Pioneer America, the journal in which the scholarly article on diamond crosses appeared. High up in the gabled ends of hundreds of century-old barns throughout Ontario appear, one or more at a time, small diamond-shaped openings with triangles on the corners, sawn through the board siding. The diamond cross first registered with me during fieldwork in Simcoe County, Ont., in September 1971. Since then, it has been an enduring blossom in my rural Ontario landscape, long defying interpretation, yet offering a path to deeper awareness of the cultural landscape of the province. The barns with the crosses were built between 1858 and 1904. Southern Ontario – the Grand River area and “an arc extending from the Lake Huron shore south of Goderich eastward through to the Kingston area” – is “the heartland” for the phenomenon, but the diamond crosses also appear in several U.S. states, as Greg noted – though not, interestingly, in New England. Allowing access for swallows and owls, more acceptable barn birds – but Prof. McIlwraith says there is no evidence that this is the reason for them. Allowing light and ventilation – though Prof. McIlwraith says that the diamond crosses “are not really very useful for either purpose,” mainly because they are so small. But what was that “external influence”? A now-forgotten decorative or even spiritual tradition brought to the New World from the Old by early settlers? The diamond cross seems to be as old as Ontario settlement, although it was widespread only about the middle of the 19th century. There are secrets yet to be discovered regarding its diffusion and acceptance; they could tell us a good deal about the mixture of social backgrounds in Ontario, and the degree of local mobility. Today, rural residents talk knowledgeably about rail fences and stone piles, but the diamond cross has left barely a trace in the consciousness or study of life in rural Ontario. The modesty of the diamond cross is so very characteristic of the unostentatious nature of the old Ontario landscape. Its decline is a matter of forgetting rather than of rejection, an expression of the progressive adjustment of immigrants from the Old World to living in the New. The notion of a rural tradition that has now been utterly forgotten fascinates me – and makes me hope that maybe it’s not forgotten after all; that maybe someone out there can shed some light on why there are diamond crosses in the barns of Hastings County and elsewhere. Okay, folks: the ball is in your court! Happy Canadian Thanksgiving, everyone! If you happened to be travelling this holiday weekend, I hope you made it there and back again safely, and in between enjoyed a happy time over good food with family and/or friends. But speaking of getting there and back again safely, I’ve decided to take this opportunity to point out a dangerous spot on the route that I and many of my fellow Queensborough-area residents drive every single day, often more than once a day. In doing so, I’m hoping to raise some awareness and give the people who might be able to do something about the situation – which includes me and my fellow Queensborough-area residents – a bit of a push to do just that: do something about it. The dangerous spot in question is the intersection of busy Highway 7 – part of the southern Ontario route of the Trans-Canada Highway – and Cooper Road, which runs north from 7 to the hamlets of Cooper and – when you turn east off it at Hazzard’s Corners – to Queensborough. 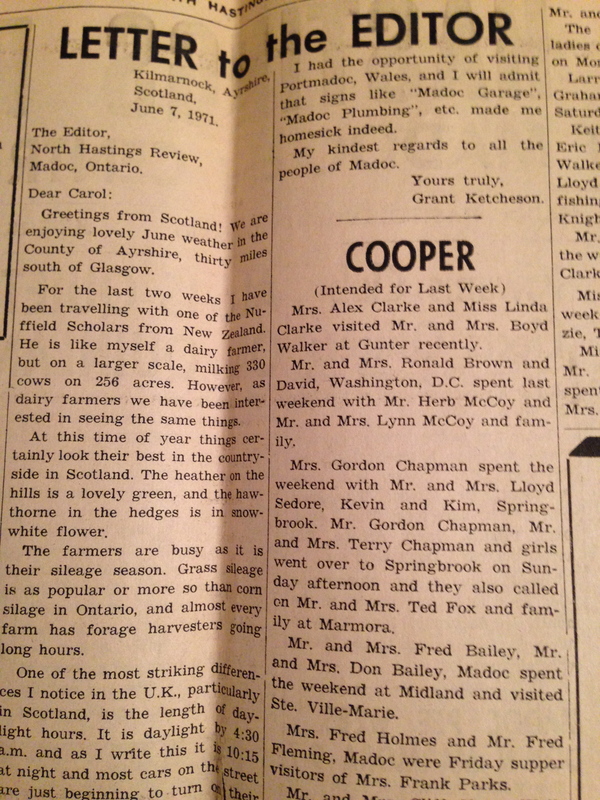 (On the south side of 7, Cooper Road becomes Wellington Street in the village of Madoc.) For us residents of Queensborough and Cooper and surrounding rural areas, “town” – the place where you buy your groceries, do you banking, etc. – is generally Madoc, which lies directly across that busy intersection. We also use the intersection to get from home to points further south via Highway 62, which runs into Madoc; I take that route to Belleville every weekday to get to work, and many others do the same. The problem is that there is no traffic control at the intersection aside from a stop sign with a flashing red light above it on the north and south sides – in other words, nothing to stop or slow down the fast-moving traffic on Highway 7 to allow us north- or southbounders through. Heading south into Madoc, or north on the way home, it’s rare that we don’t have to wait for one or more cars or transport trucks to pass on Highway 7 so that we can safely cross. Everybody’s used to that. But there are many times in the year – notably during the summer months, when Highway 7 is crammed with vacationers pulling camper vans heading both east and west, and also on holiday weekends like this one just ended – when the traffic comes in a steady, speedy stream. You have to be so patient and so careful, constantly looking in both directions, for a space between vehicles that’s sufficient for you to zip across. On really busy days the wait can be five minutes or more. To get an idea of what we’re up against, click on my video at the top of this post: I took it early this afternoon. I didn’t wait for the Highway 7 traffic to get crazy – just pulled over to the side of Cooper Road and filmed the first minute’s worth of traffic that came by. What you see is utterly typical of the highway under summer and holiday-weekend conditions. The danger, of course, is that people, being people, get impatient waiting to get across. They may be late, or in a hurry to get somewhere, or just have a very low tolerance for waiting. Impatience and frustration can lead to risk-taking: darting through the fast-moving east-west traffic when there isn’t enough between-car space to make it across safely. I’ve seen the aftermath of one very nasty accident at that intersection, and I have no doubt that there have been quite a few more. The sign on the south side of the busy intersection: Highway 7 and Wellington Street in the village of Madoc. On the north side, Wellington Street becomes Cooper Road, Hastings County Road 12. I’ve been thinking about this problem for some time, doubtless because, as mentioned, I use that intersection at least twice every weekday and several times on weekends too. But I got prompted to write this post because of a story a Queensborough neighbour told me a couple of weeks ago. His wife had been driving east on Highway 7, signalled and stopped to turn left (north) onto Cooper Road toward Queensborough, and was struck by a tractor-trailer. Mercifully the truck driver saw his error in time to swerve a bit and hit primarily the passenger side (she was driving alone) rather than crashing straight into the back of the car. She did not suffer any major injuries, though her car of course did; and my lord, what an absolutely terrifying experience. You see, in addition to there being no lights to control Highway 7 traffic at the intersection, there are also no turn lanes for the many vehicles that turn north off it toward Queensborough or Cooper, or south into Madoc. Yikes. I haven’t looked into this situation enough to know why there are lights at one busy Madoc intersection and not at another; perhaps the Ontario Ministry of Transportation (which I assume makes the decisions on traffic lights on provincial highways) gives priority to an intersection of two highways – in this case, 7 and 62 – over a one-highway/one county road – Highway 7 and Hastings County Road 12 (Cooper Road) – intersection. But shouldn’t safety come before ministry priorities? Highway 7 is pretty much the dividing line between two municipalities: Madoc Township to the north and Centre Hastings (which includes the village of Madoc) to the south. Not long ago I asked a member of Centre Hastings council about this situation; the council member told me that the transportation ministry is the body that has to take action. The advice I got was to gather people’s voices and ask the ministry to do something. Which I suppose is what I’m doing here, although I think it would be appropriate for the councils of Centre Hastings and Madoc Township to weigh in with the ministry as well. Horrible highway accidents are not in anyone’s best interest; safe roads are good news for everyone. I spent some time this evening poking around the transportation ministry’s website, and you probably won’t be surprised to hear that I could find no obvious link for “I want to report a dangerous intersection where your ministry should install traffic lights.” I suspect that the best way to start on this one is to contact our elected representative at Queen’s Park. Members of Provincial Parliament have staff and contacts and know-how about government affairs that we ordinary people do not; plus what they’re paid to do is represent us on matters that concern us. Our MPP is Todd Smith, and he’s a friendly guy who was right here in Queensborough just recently, for our wildly successful Historic Queensborough Day. If you agree that this intersection needs a look and some action by the ministry, you can ask Todd to speak on our behalf by calling his constituency office in Belleville (613-962-1144; toll-free 1-877-536-6248), emailing him at todd.smithco@pc.ola.org, or writing to him at P.O. Box 575, Belleville, Ont., K8N 5B2. See that chap in the blue polo shirt standing behind Sir John A. Macdonald (I am not making this up) on Historic Queensborough Day last month? That’s Prince Edward-Hastings MPP Todd Smith, and he’s the guy to contact if you agree with me that the Highway 7 intersection that many of us use every day could be made safer by the provincial transportation ministry. And while you’re at it, why not contact some or all of the members of Centre Hastings council (click here for contact info) and Madoc Township council (members here, though contact information is a little skimpy; the township office’s number is 613-473-2677, and you can contact the township clerk by email at clerk@madoc.ca) to ask them to make the case to both Todd Smith and the transportation ministry? As we saw with the successful battle to save Madoc Township Public School, it is possible to make rural voices, issues and concerns heard. But that won’t happen unless we take it upon ourselves to speak up. And hey, let’s hark back for a moment to my midcentury Queensborough childhood and ask: what would Elmer the Safety Elephant do? Queensborough (starred in this Google map) is within a 15-minute drive of two larger centres: Madoc (centre left) and Tweed (lower right). Officially we are part of the Municipality of Tweed (or the Greater Tweed Area, the GTA, as some wags like to call it), but our connections – schools, shopping, and most especially postal service – are historically closer to Madoc. Click here to read an earlier post about whether “going to town” means Madoc or Tweed for us. RR#2 was the route based out of the Madoc post office that covered Queensborough and surrounding areas. RR#1 was the section of Madoc Township more or less due north of the village of Madoc, while RR#3 was the hamlet of Cooper and environs. I think there were a couple of other RRs for the areas south of Madoc as well. When Raymond and I bought the Manse five years ago – Five years already! Wow! – and my focus returned to Queensborough after an absence of almost 40 years, I was vaguely aware that the RR number alone wouldn’t cut it any more, address-wise. Sometime during the 15 years I’d lived in Montreal, Ontario had decided that every address needed a street number, even if the street in question was a dusty country road. The main reason for this, as I understand it, was so that emergency responders could more easily find where they were going – and so were born what rural Ontarians call “911 numbers,” as opposed to “addresses.” This initiative also resulted in rural roads that had never before had names suddenly getting them. The road that the Manse was on, nameless back in my 1960s and ’70s childhood here, is now Bosley Road, named for one of the families that once lived on it. And the Manse’s number on Bosley Road – its 911 number – is 847. Our brand-new (in 2012) mailbox at 847 Bosley Rd., RR#2 Madoc. But then the post-office clerk made that comment about not using RR numbers. Clearly this required further investigation. It turns out that, just in the period when Raymond and I were still living and working in Montreal and visiting the Manse on weekends when we could, Canada Post was beginning the process of eliminating rural routes. You can read about that here and here, in pieces out of the Grande Prairie (Alta.) 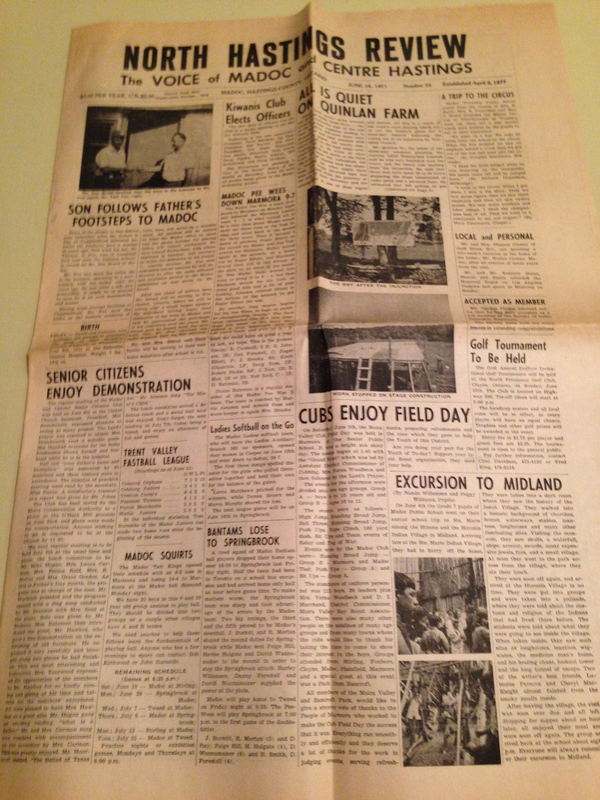 Daily Herald-Tribune and the more local Peterborough Examiner from late summer and fall 2012, a few months after we bought the Manse. Now, I like to think I’m reasonably plugged into the news – being a journalist and all – but somehow or other I remained utterly oblivious to this development at Canada Post. I am pretty sure it’s because during the main period of its implementation I was still living in Montreal, where RRs are unknown and have zero impact on daily life. One: Most of the time, kept using RR#2 in my address. Because it’s the old-fashioned way, and I like old-fashioned things. Two: When I’m rushed – like, when I’m trying to write many dozens of Christmas cards, as I was last month – dropped the RR#2 from my return address, knowing that not only would it still be correct, but Canada Post would probably like me better. Three, and this is the big one (not to mention the point of this post): Begun to wonder and worry a bit about where Queensborough falls in this brave new RR-less world. Let me explain. But here’s the thing: in the late 1990s, when the Ontario government in its wisdom decided that many small Ontario municipalities needed to merge into each other and become larger (and theoretically more efficient) municipalities, Queensborough became a part of the newly created Municipality of Tweed. Until then we had been one of the two (or was it three?) hamlets in the extremely rural municipality known as Elzevir Township; but Elzevir, while it still exists in name, is now part of the much larger Municipality of Tweed, which also swallowed up the former Hungerford Township south of the village of Tweed. 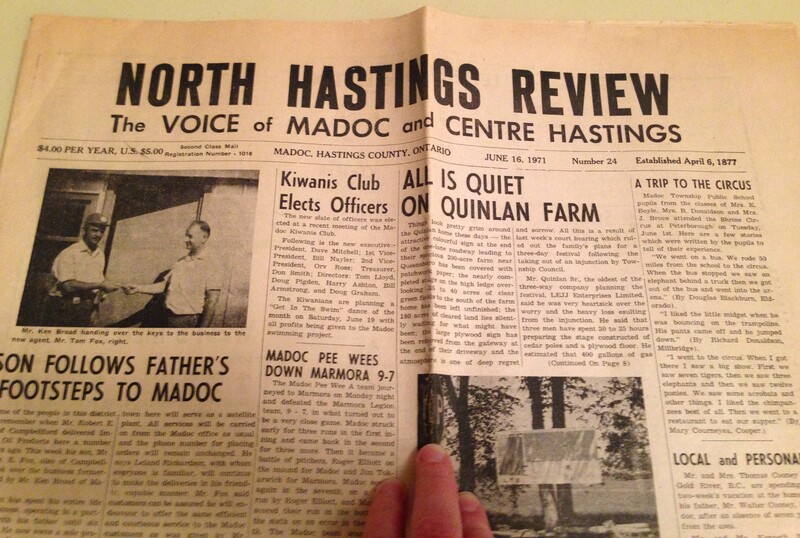 At the same time, the former village of Madoc and township of Huntingdon merged to become the Municipality of Centre Hastings. Many other such mergers happened all over the province, with the resultant sad loss of many historical names and geographical designations: goodbye, for instance, Victoria County, and hello “City of Kawartha Lakes.” Don’t get me started. The Municipality of Tweed includes us here in Queensborough. Anyway. Long story short, Queensborough is and has been for nearly two decades a part of the Municipality of Tweed. We pay our taxes to Tweed, we take our trash and recycling to the dump in Tweed, we vote for Tweed councillors (and are quite ably represented by them); in pretty much every reckoning, including geographically, we are part of Tweed. Which makes it look like Bosley Road is in Madoc! Which it isn’t! Yikes! Wrong town! While we had that RR in place, the Madoc part of our address made sense; without it, it doesn’t. Bosley Road is, for better or worse, in Tweed. The post office in Madoc, whence comes the mail that arrives at the Manse and in the rest of Queensborough. But is Madoc our address? It’s a bit of a puzzle. I fear that the disappearance of RRs from our addresses is going to lead to future confusion. Already Google and other online location services are befuddled. When, for instance, I post a photo on the social-media app Instagram and try to add my location to it, things go quite haywire. The suggestions that come up include “Queensborough Community Centre, 1853 Queensborough Rd., Madoc” (which, again, makes it sound like the community centre is in Madoc when in fact it too is in Tweed); “Tweed, Ontario”; “Madoc Fair Grounds, Madoc”; “Eldorado, Ontario”; and so on. Not the one designation I do want, which is, of course, “Queensborough, Ont.” When I do a search for that, I get no results. So yeah: this disappearing RR thing is leaving us in Queensborough in a bit of location limbo, We know where we are; but will people trying to find us? Then again: what better way to keep our little jewel of a village our own special secret? A copy of the Cooper Comets Cook Book from sometime in the mid-1970s – do you happen to know when? There is no date on it – has made its way to the Manse. I couldn’t be more thrilled! A treasure, people! And I don’t use that word lightly. Oh all right – maybe when it comes to finds from the era of my 1960s and ’70s childhood here at the Manse, I do use the word lightly. What I mean is: all such finds are treasures to me, be assured. 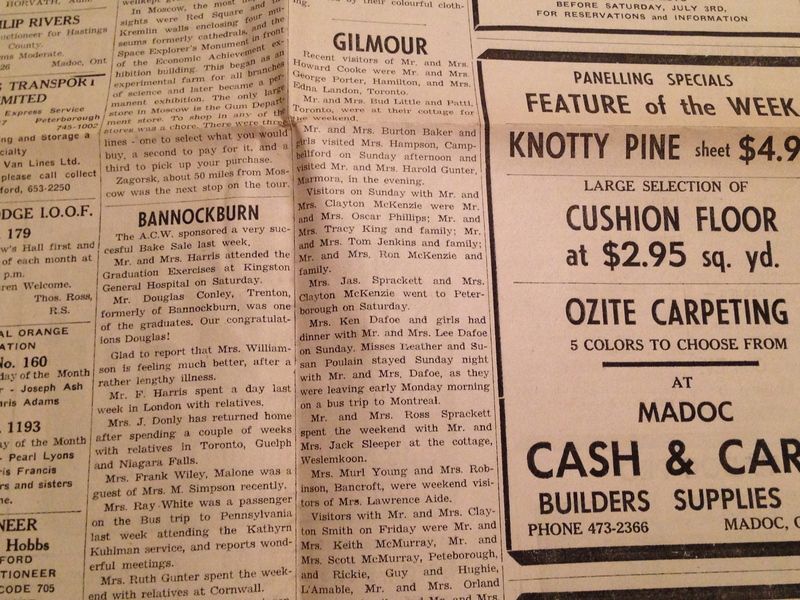 But sometimes I suspect readers must roll their eyes at my breathless reporting on my vintage finds, whether they be pieces of Blue Mountain Pottery, or multiple copies of Donna Parker in Hollywood, or old roadmaps, or a record by the Singing Post Family. “Why is she accumulating all this junk?” is probably the question in at least a few minds. Because, as we’re constantly told these days, our mission is to declutter, to simplify our homes and thus our lives by keeping only the things we constantly need and use. Well, I ask you: where’s the fun in that? Anyway, a desire on someone’s part to get rid of – well, if not exactly “junk,” at least something that this person considered old and no longer useful, is what was behind my latest thrilling vintage acquisition, the topic for today’s post. I have my Queensborough friend Jen to thank for my newly acquired copy of the Cooper Comets Cook Book. Jen happened to be in one of the local hardware stores recently when someone there – I’m not sure whether it was a customer or an employee – brought forth this delightful little volume and announced that he or she was getting rid of it. Jen, who well knows my love of local history and artifacts, immediately offered up that she knew someone who would be thrilled to have it. And before you know it, the Cooper Comets Cook Book was in my hands. Which means I get to share it with you good people! My most treasured cookbook from the days of my childhood here at the Manse. One: It’s a classic example of those locally produced midcentury cookbooks that I’ve written about before – the ones in which members of a church group like the United Church Women, or of the local branch of the Women’s Institute, or of a sports organization, or of a school group, get together and contribute their own recipes and those they can beg, borrow and steal from their friends, mothers and mothers-in-law, so that a cookbook can be produced and sold as a fundraiser for the group in question. My most treasured example of these cookbooks is the Queensboro Cook Book, produced in 1966 by the U.C.W. 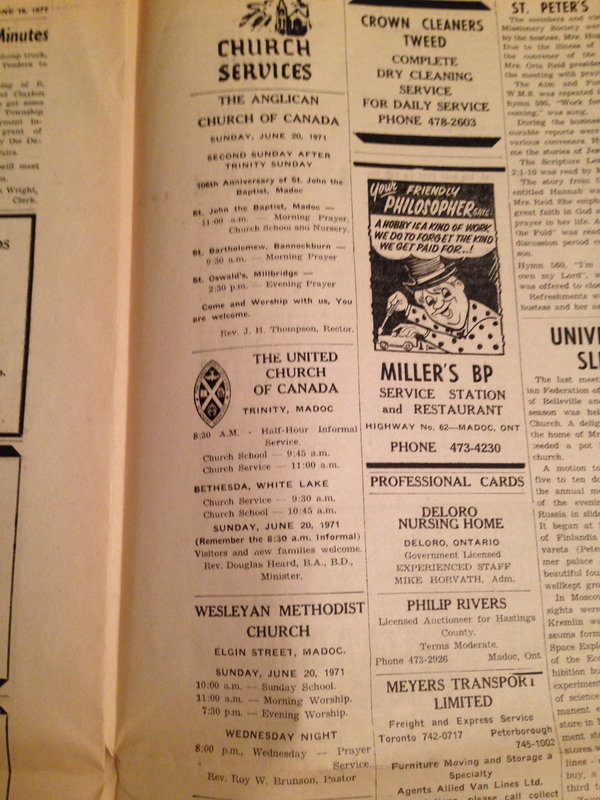 of St. Andrew’s United Church in Queensborough; thanks to two wonderful women and Queensborough natives, Barbara Martin and the late Isabella Shaw, I have two precious copies of that foodstained cookbook. But the Cooper Comets Cook Book is now a close second to it in my heart. The introductory page of the cookbook, including a listing of the team members at the time of publication. So many familiar names! A typical page of the cookbook: half recipes, half ads. What a delight to see that one of those ads is for Johnston’s Pharmacy, still in business (though now in a new location) all these years later! Some of the many vintage cookbooks filling a bookshelf dedicated to them at the Manse. And finally, of course, there are the recipes. As I’ve written before, I love vintage cookbooks in general, and have a fairly good collection of them. I am intrigued by what these culinary guides tell us about the lives of people in those eras – what they ate, how they prepared it, and what their attitudes to food were as compared to how we approach food and cooking now. (Hint: they were a lot more Jell-O friendly in those days.) Now, many of my vintage cookbooks are by “the experts” – people such as James Beard, and Julia Child, and Elizabeth David, and Irma Rombauer (of The Joy of Cooking), not to mention giant food companies like Betty Crocker and homemaking publications like Chatelaine and Better Homes and Gardens. But many others are collections from groups like the St. Andrew’s U.C.W. and the Cooper Comets. These recipe-writers are not famous TV chefs like Julia Child, or newspaper food columnists like James Beard, or literary types like M.F.K. Fisher. They are ordinary women who had busy lives and families to feed when they weren’t doing chores on the farm or working at a part-time or full-time job in town. They did not have a lot of time for fancy-schmancy stuff in the kitchen. Many of the recipe titles feature the words “quick” or “easy;” many of the recipes are along the lines of casseroles whose ingredients are hamburger (“hamburg,” as we used to call it back them), a can of soup and some bread crumbs on top, perhaps with some ketchup or mustard and salt and pepper added in for “seasoning.” And you know what? There is nothing wrong with that. So yeah: this cookbook is my new favourite thing, and I thank the person in the hardware store who parted with it, and Jen for her quick thinking in nabbing it for me – and most especially the women (some of whom are no longer with us) of the Cooper Comets – who in my eyes were, and are, superstars of sports, cooking and the home front. Ladies: play ball!